St. Joseph Apache Mission church sits nestled in the heart of the Sacramento Mountains where it stands as a tribute to the faith, patriotism and courage of the people of southern New Mexico. 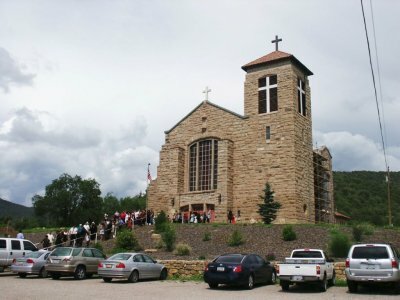 This inspiring Romanesque church was built to serve the people of the Mescalero Apache Reservation, and has been dedicated as a memorial to veterans who gave their lives in World War I and II. Through the years St. Joseph Apache Mission has continued to serve the spiritual and communal needs of the Mescalero Apache and surrounding neighbors. We are now able to accept Donations on line! was officially entered in the National Register of Historic Places. federal list of historic properties worthy of preservation. The Restoration Committee wants to thank Mescalero Apache Telecom, Inc.
for designing and hosting this site at no charge.